I have to say it has been a long time since I read a news story that made my blood boil – but a recent news obit about a Somalia-born teen killed in the Norway massacre on a camp island this week still has me seething. From the headline to the last graph of the New York Times story published Monday, August 1 the use of gay euphemisms and stereotypes is a disservice not only to readers but also to the memory of the young murder victim Ismail Haji Ahmed. Despite heavily implying the young man was gay, the story never once just comes out and says so. Nor does it ever state if the author bothered to ask the boy’s friends and family outright if he identified as gay or bisexual. 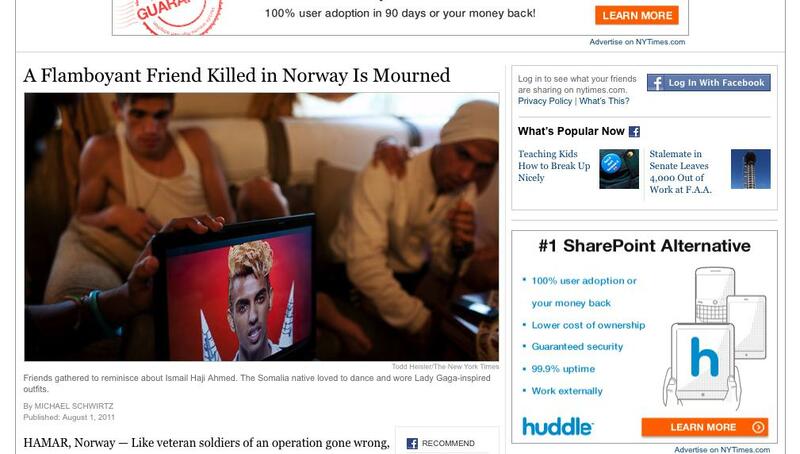 Instead, we are given a headline – “A Flamboyant Friend Killed in Norway Is Mourned” – and story full of winking nods to his presumed sexual orientation that reads as if it were straight from the 1950s. And when did a teenager’s liking pop music and dancing become out of the norm? His parents tolerated his somewhat unorthodox lifestyle to a point, his brother said, and he accommodated their wishes when possible. He agreed, for instance, to his mother’s request to dye his bleach-blond mohawk dark for Ramadan. Mr. Ahmed was like them to a point. While it appears to refer to Ahmed’s darker skin tone compared to his immigrant friends from central European and Asian countries, it also reads as if his supposed gayness makes him less than somehow. Reading at the end how his friends washed his body according to Islamic custom, I could not help but wonder if his religious affiliation prevented the reporter from asking whether Ahmed was gay or reporting that in the article. The result is a story I would expect to find in a gay-intolerant tabloid than in the pages of the venerable NY Times.